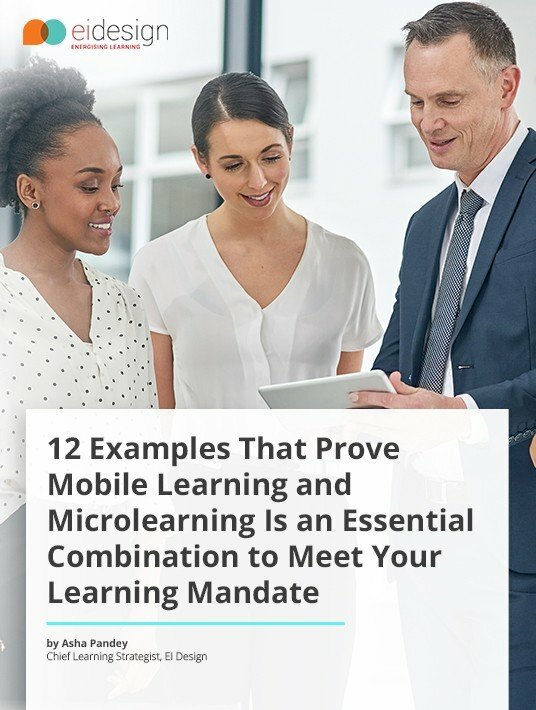 This free eBook, 12 Examples That Prove Mobile Learning and Microlearning Is an Essential Combination to Meet Your Learning Mandate, is designed as a guide for organizations to enhance their existing strategy by understanding Mobile Learning and Microlearning and using their combination in online trainings. - What is Mobile learning, and what are its key highlights? - Impact of Combining Mobile Learning and Microlearning. - Why you should adopt the combination of Microlearning and Mobile learning? - What is the value that the combination of Microlearning and Mobile learning will deliver? 12 examples of Microlearning delivered in the Mobile learning format. Many choose to show the way by means of theory, but what you get here are examples and answers to specific questions. Of course, EI Design also puts in an introduction, so that you fully comprehend what Mobile Learning and Microlearning are, and what they can do for you, especially when combined. All the reasons to beneficially design your corporate training accordingly, are layed out for you in this eBook.